Turn off the power to electric devices, such as audio and lights. Turn off the engine, then open the hood. Connect the first jumper cable to your vehicle's battery + terminal. Connect the other end of the first jumper cable to the booster battery + terminal. ► Use a 12-volt booster battery only. 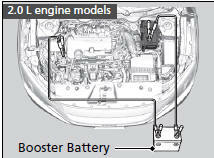 ► When using an automotive battery charger to boost your 12-volt battery, select a lower charging voltage than 15- volt. Check the charger manual for the proper setting. Connect the second jumper cable to the booster battery - terminal. WARNING A battery can explode if you do not follow the correct procedure, seriously injuring anyone nearby. Keep all sparks, open flames, and smoking materials away from the battery. 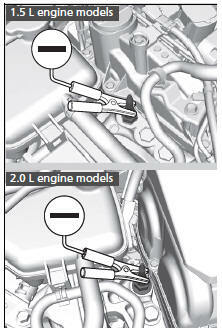 Securely attach the jumper cables clips so that they do not come off when the engine vibrates. Also be careful not to tangle the jumper cables or allow the cable ends to touch each other while attaching or detaching the jumper cables. Connect the other end of the second jumper cable to the engine mounting bolt as shown. Do not connect this jumper cable to any other part. If your vehicle is connected to another vehicle, start the assisting vehicle's engine and increase its rpm slightly. Attempt to start your vehicle's engine. If it turns over slowly, check that the jumper cables have good metal-to-metal contact. 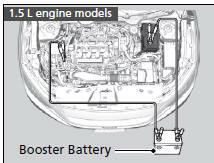 Battery performance degrades in cold conditions and may prevent the engine from starting.